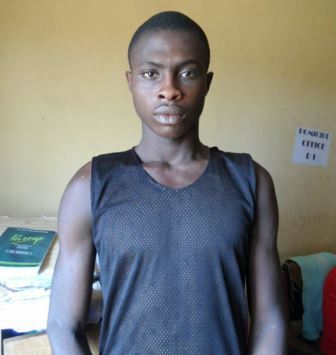 A 23-year-old man, Adeoye Ikugbayigbe, has been arrested by the Ogun State Police Command for allegedly beheading a 72year-old-woman, Funmilayo Shada, following an argument over land. Ikugbayigbe was arrested after the deceased’s son Ekundayo Shada reported the matter to the Abigi Divisional Headquarters Monday. According to Ogun Police Public Relations Officer, Abimbola Oyeyemi, an Assistant Superintendent of Police (ASP), Ekundayo was on his way to meet his mother at their farm when he saw Ikugbayigbe on the road holding a polythene bag. “As soon as Ikugbayigbe sighted him, he dropped the bag and ran into the bush. This aroused Ekundayo’s suspicion and he quickly ran to check his mother but could not find her. He later came back to check the bag dropped by the suspect only for him to discover his mother’s severed head and her wrist in the said bag. “He quickly reported the case to the police and the DPO Abigi Division, SP Komolafe Omoniyi led detective to the scene, combed the surrounding bush and finally got the suspect arrested. “On interrogation, he confessed to the commission of the crime claiming that he has been having a running battle with the deceased over a portion of land. The severed head and the remains of the deceased have been deposited in the mortuary while the cutlass he used has also been recovered”.